A period of seven days, from Monday 3rd to Sunday 9th September, eyes were focused on Mauritius, as the best players in the continent converged for the 2018 ITTF African Championships; additionally Thomas Weikert, ITTF President, attended, leading the Table Tennis for Life for All Forum. However, above all there was one man on whose shoulders rested the responsibility of delivering a successful tournament, Rajessen Desscann, Tournament Director. It was a major a challenge for the former international, one he met, the result being a most rewarding experience for the Mauritius Table Tennis Association. “This was the third time that the Mauritius Table Tennis Association had organised a Senior African Championships. The association nominated me as Director of tournament. It was a challenge for me. We were honoured to host the best African players in our country; all Mauritian players and fans were thrilled to see the top African countries at their best. The African Champion Quadri Aruna is well known in Mauritius. He has lots of fans here and they were not disappointed. We were honoured to welcome for the very first time in Mauritius an ITTF President. This shows his interest for table tennis in Africa. Also, a half day visit was conducted by the ITTF Foundation to the Rehabilitation Youth Centre. The other event that took place was that for the first time table tennis was played under water in a submarine for the promotion of table tennis around the world by the ITTF team. It proved a successful tournament because we selected people who are firstly passionate about table tennis, most of them being former national players. We had a dedicated team who worked hard to make the event a success. We had the support of the Ministry of Youth and Sports, the Mauritius Olympic Committee, the private sector and of course the African Table Tennis Federation and International Table Tennis Federation. We had a few challenges concerning lodging as we had a record participation of 22 countries; we did our best to welcome everyone. 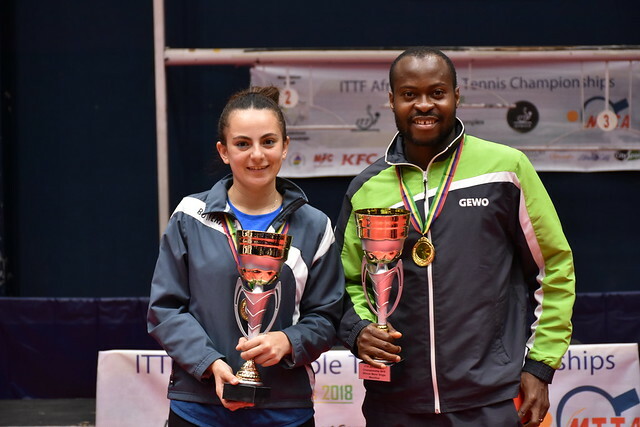 We also had for the first time in an African Championship a forum organised by the ITTF for all African countries. The challenge was to manage both events simultaneously and I am very proud that Mauritius organised the Forum; I hope that everything discussed during the Forum will become reality. I hope it will help African table tennis move to the next level. It’s high time for Africa to have a new vision for table tennis and all African countries should be united, so that we all move in the same direction for the benefit of our sport. This type of competition gives our players better exposure. We have many young players who are preparing for the Indian Ocean Island Games next year; this tournament will surely help them in their preparation and assess weaknesses, areas to be improved. As Director of tournament, I am very proud to have hosted this event with so many countries present.